Go ahead and save a new new Savingstar eCoupon where you can $5 off $25 worth of select household products! 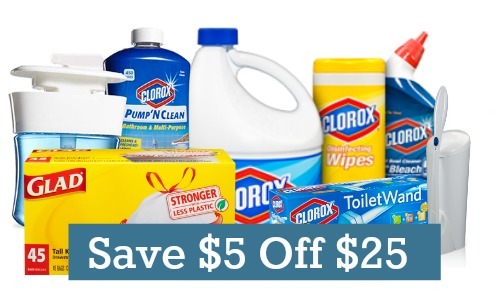 You’ll save big on Glad trash bags; Clorox wipes, liquid bleach, toilet bowl cleaners, ToiletWand, Pump N’ Clean, and Clean Up and Scrub Singles. The great thing about this Savingstar eCoupon is that you can stack it with other manufacturer coupons to save even more. This would be a great coupon to use when you shop from the Best Deals on Cleaning Supplies List. This coupon expires 4/30. If you are new to SavingStar this coupon will track you over time across multiple stores. So you have over two months to buy $25 in these items and when you do you’ll get $5 back in your account with SavingStar. This doesn’t come off at the register, but is more like a rebate that doesn’t require any work on your part! !